The tweet from one of our own MPs John Healey, the member for Wentworth & Dearne, has gained some wonderful media attention and his tweet has had the most comments and re-tweets on any of his tweets in his tweeting history. Now Guido has caught up on Healey’s unforgiving tweet. Healey hasn’t even had the decency to publicly apologise. 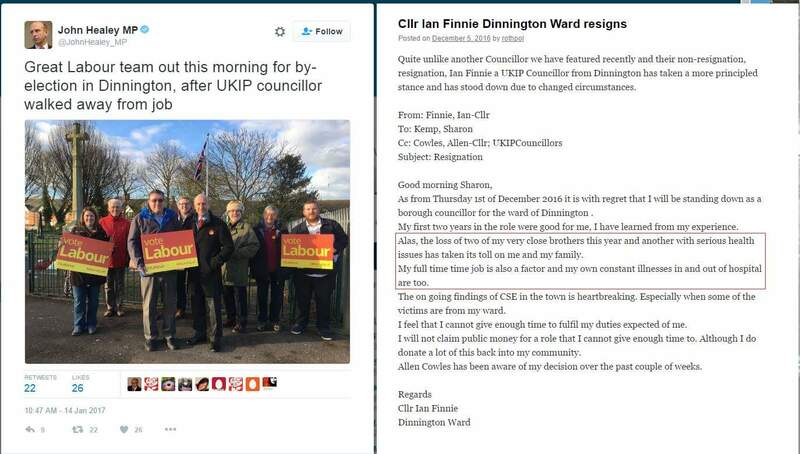 I gather he doesn’t read Rothpol when the letter of resignation from UKIP ex Cllr Ian Finnie was published. He would rather discredit an honourable man than his own disgraced sexual abuse ex Labour cllr, but nothing surprises me anymore in this town. I also wonder if his Labour supporting Cllrs and colleagues dismiss his comments and will they distance themselves from him or will they also be equally hypocritical. John Healey’s dismissive attitude to people and families coping with chronic health and mental health issues are just the sort of attitude we see from these self-serving out of touch MPs. This entry was posted in Abuse of power, Information and tagged Dinnington Ward, Guido Fawkes, John Healey, John Vjestica, Labour Chicanery, Labour Party, RMBC, Rotherham Metropolitan Borough Council, Rotherham’s Disgrace, Scum Labour by Rik. Bookmark the permalink. Notice that Guido Fawkes has picked up on Healey’s Tweet Shame. Guido’s twitter feed is going nuts and far from complimentary to both Healey and the Labour Party. The ‘cosy’ pic of Healey and his mates campaigning in Dinnington is not quite what it seems. Looks like John Vjesticus (ex Head of HR at RMBC) and standing next to Healey, has been wheeled out yet again to try for election. He is almost a serial Labour campaign reject. His 34 years at RMBC will mean he knows an awful lot of meaty ‘secrets’ and especially being steeped within the regime of Stoney and Akhtar…….and of course, he will have brokered the deal with Sheffield Council to allow Shabana an employee (when she was councillor) to work in Rotherham. Also notice Momentum member Cllr Richard Price (and Shabama’s agent) was out in Dinnington on the stump. You’d have thought he’d be helping the Momentum ‘pin up’ girl Shabana instead. Looks like Healey is moving to the left as he has gathered far too many splinters in his back side over the years from fence sitting to cope with any more. That’s probably why he always tries to stand at the end of the chamber when Parliament is in session I imagine. Apparently the wonderful Mr Vjestica is going to bring 10,000 jobs to our area, which is impossible but if you are Labour a few exaggerations and untruths is acceptable. Mr Healey should make a full public apology and then sod off back to his own part of Rotherham, I note Cllr Beck in the picture, the very same councillor that had to resign from the cabinet. Our very own MP Sir Kevin Barron has never spoken out about Cllr Beck`s antics, and now we have Mr Healey apparently endorsing him also. Why would these two want to be seen with this one?. As with cse, election exes and flying pigs! John Healey is a sleazebag. If Healey and his gang of limited brainpower mates had bothered to read Ian Finnie’s resignation letter-or even understand why there is an election-he would not make ,crass and insensitive comments. Lying and twisting facts is the norm for the Labour party in Rotherham. Will they suspend campaigning as a mark of respect for the young girl found murdered in Dinnington yesterday? Healey does not represent this ward nor does the Boy Blunder Beck. Is Sir Kev staying at home to spend more time with his wallet? He sold out and betrayed the miners to kinnock and nu labour. He is an MP to promote pharma interests. If they willing to treat him or pay exes etc. If he was an honourable man he would apologise – unfortunately honour is a word he cannot quite grasp !